I’m back, with more ideas on cutting your flock’s feed bill by using free chicken feed sources. Layer feed can get expensive so I try to cut costs as much as possible by finding various ways to feed my chickens. We've talked about Garden Rejects and cooking damaged or dirty eggs as frugal feed sources for your chickens. This time we’re looking at weeds. Yes, really! Not only are many weeds highly nutritious and completely edible, but it’s an awesome motivation to start weeding that garden! There are literally dozens of weeds that you could be feeding your chickens and they will love you for it. Here are a few that I feed to my chickens on a regular basis and they grow just about everywhere. Clover: Clover is another of my chickens favorite treats. I just yank a few handfuls out of the ground and toss them into the run and the chickens go nuts! Two more favorites but not pictured are: fat hen (lambsquarters) and chickweed. That should be easy to remember, right? If you’re lucky enough to have wild carrot or wild strawberry growing, they love that too. You can also grab a few handfuls of grass out of the bag next time you mow the lawn and throw that to the chickens. Of course if something is unfamiliar to you, take a minute to look it up before you toss it in the run. Just in case. Also, if anything has been sprayed with pesticides then it’s best to just skip it. Why take chances? I have no better motivation for weeding the garden then those cute little fuzzy faces begging for treats. However, if you’re weeding to remove the weed from a garden, etc make sure you yank the whole root. 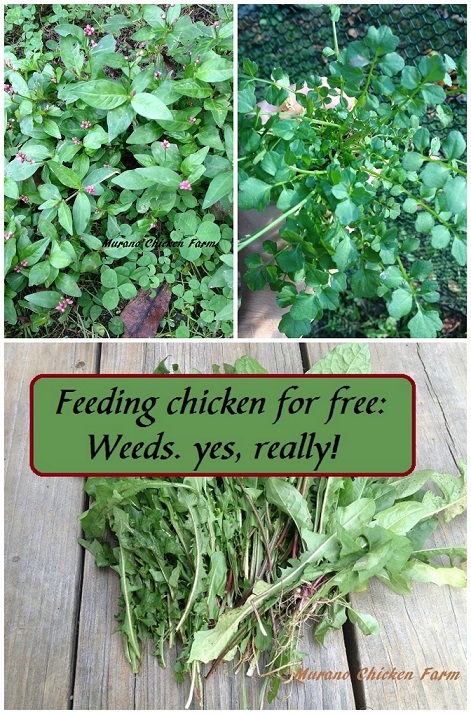 If you’re weeding just to feed the chickens simply pull off the leaves and most grow back shortly for a new treat. That way you’ll have a never ending supply of free treats! Happy weeding! Thanks to Natural News for the recent mention of this article when it appeared in Backyard Poultry mag! My chickens free-range and I have a backyard full of dandelions that they will not touch with a ten foot pole. Odd. In any case, thanks for linking up with the Clever Chicks and have a great week! Ya know, my free range flock wont touch them either but if I throw them into any of the pens they go nuts for them! Must be a "grass is always greener" thing. LOL! Can't beat free! This is a great post for me to keep in mind as we hope to get chickens when we move. Thanks for sharing on The Maple Hill Hop!